A top class inning by Kevin Joseph and thumping blows from Kevin Walker ensured Vikings remained unbeaten as they convincingly defeated 2013 champions Vincy by 7 wickets in the final Super Six match of the Digicel Twenty/20 tournament. 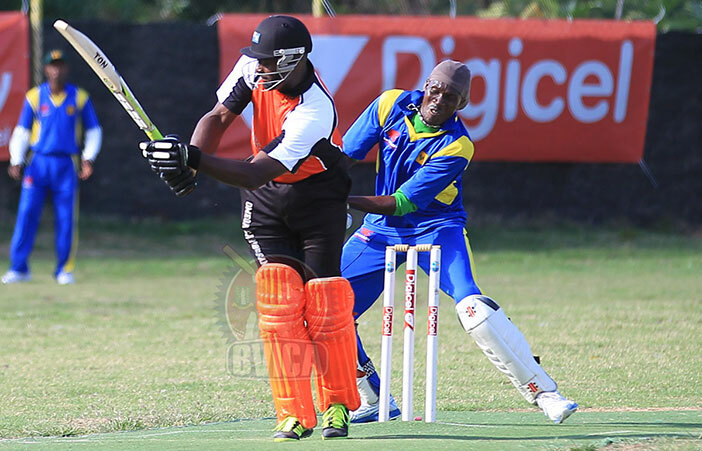 The two teams played on Sunday, May 18 and Vincy needed a victory to advance to the finals to have a chance to defend their title. The defeat is a big blow to Vincy who find themselves with 9 points and tied with Grenada and four-time champions, Cavaliers – all having won three matches. However, Cavaliers will advance to play Vikings in the finals on Sunday, June 1 because of their superior net run rate (NRR), which is calculated based on overs, runs scored and the runs opponents score. Cavaliers’ NRR is 2.74, Vincy’s NRR is 2.22 and Grenada’s NRR is 1.23. Batting first on Sunday, Vincy posted 190 for 6 from their 20 overs and Vikings responded with 194 for 3 in 16.4 overs. Vincy looked the part very early when Vikings won the toss and elected to field. Despite losing opener, Keelan Robin very early, Maxford Pipe and Austin McDowell staged a 112-run partnership that tilted the momentum in Vincy’s favour. Pipe departed for 48 runs (5 fours and 3 sixes) to Johnny Bailey when veteran Winston Davis cradled a catch from a fiercely hit ball. Vincy lost McDowell with the score on 148 when Jnique Mingo trapped him LBW. McDowell scored 75 runs from 49 balls, including 6 fours and 5 sixes. Mingo, who bowled 3 wickets for 31 runs, also removed the dangerous Montgomery ‘Monty’ Buttler for 10 runs when wicketkeeper, Anil Mahabir took a sharp catch. Sylvester Mitchell was bowled by Mingo for 10 runs and Vincy never recovered as their inning ended on 190 for 6. Bailey finished with 2 wickets for 23 runs and Jamal Mickle snatched a wicket. Vikings stumbled out the gates, losing their in-form opening batsman and captain, Richard Fredericks for duck when Kenrick Leslie climbed in the air to take a sharp diving catch from the bowling of former Leeward Islands bowler, Brent Defreitas. The other opening batsman, Davis, fell cheaply for 6 runs when he sent a catch to Pipe on the boundary. Vikings was in trouble at 17 for 2 when Walker took guard in the middle. The first ball faced he dispatched for six and followed that up with a boundary, much to the delight of the fans. Walker faced 32 balls, struck 4 fours and 6 sixes for 55 runs before he was bowled by Turby Xavier. He shared a 68-run third wicket partnership with Joseph. Joseph continued after Walker’s departure, playing polished drives along the ground, oftentimes dissecting the Vincy field to perfection. When he needed to, Joseph struck clean sixes through the air. He ended one of the more cleanly assembled innings played at Greenland not out on 78 runs, which included 5 fours and 8 sixes from 46 balls. Joseph and Bailey came together with Vikings on 85 for 3 and together they steered Vikings to victory, sharing a 109-run partnership in the process. Bailey was left not out on 31 runs, faced 18 balls and struck 4 fours and 2 sixes. Entering Sunday’s game, Vikings had already qualified for the finals. They now face archrivals, Cavaliers and a chance to win their first official domestic Twenty/20 Cricket Tournament. Earlier in the Super Six stage, Vikings defeated Cavaliers for the first time in 6 years, winning the close encounter in the final over by 2 wickets. Cavaliers must rebound if they are going to win their fifth title in six years.